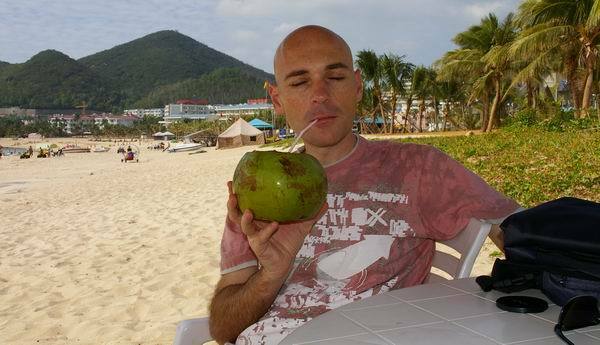 Sanya is an interesting place. In fact Sanya is a number of very distinctly different places, the primary areas are Sanya City, Dadonghai and Yalong Bay. We were staying in Dadonghai which is a big tourist area. The hotel we stayed at was (we were told) once the best in Sanya - but now the Pearl Seaview Resort is nothing but a memory of its glorious past. Pearl Seaview Resort is on the Western end of the Dadonghai beach. 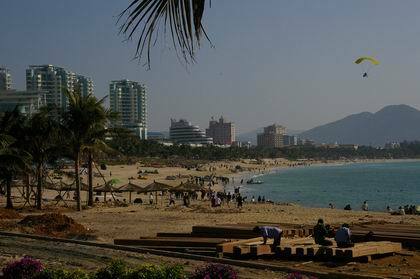 Dadonghai beach is a very nice beach with soft white sand and lovely blue / turquoise water gently rolling on to the sand, there is no surf, which makes a very safe option for the large majority of Chinese who cannot swim. There are designated swimming areas which are marked by floating balls and rope, at first I thought it was a shark net swimming enclosure, but I soon discovered it was only to keep the swimmers moderately safe from the constant zooming around of tourists on hired jet-skis and speed boats. Emerging from the water was just as dangerous as swimming in it because of the constant flow of traffic in the form of quad runners (4 wheeled motor bikes) and dune buggies flying up and down the beach. I'm not sure which scared me the most; the obviously inexperienced (read - never has driven before) Chinese person behind the wheel of one of these things or the crazy white dudes throwing them around doing donuts or power slides because in most countries you can't drive something like that on a public beach - so they love it. The beach itself had lounges with thatched umbrellas for the sun lovers, they generally belonged to the resorts, but there was one public use area which charged 50RMB for 2 seats, no time limit. You could also buy fresh coconuts for drinking - only 5RMB each. Its very nice sitting in the shade on a hot day drinking fresh coconut milk. The food was fresh all around Sanya, but only good if you liked seafood. I think we had a steamed fish every day we were there. They have dozens of restaurants with plastic tables and chairs and huge fish tanks. A lot of these restaurants didn't even have menus, you walked up to the fish tank and selected what you wanted to eat. The person serving you would grab a net and fish out the fish you wanted and then proceed to slam it on the ground (that was to incapacitate it while it got weighed - nothing worse than an inconsiderate fish jumping off the scales when they are trying to weigh it), I didn't really like to see that part , but its a fact of life. I must admit I did get sick of steamed fish and prawns because we had them for lunch and dinner for just about every day! The other great thing around the area is fresh fruit. There were literally dozens of people selling fruit, either women carrying 3 baskets on either end of a pole over their shoulder or from the dozens of bicycle mounted fruit carts (Sabrina was in her element). The annoying things were the vehicles on the beaches. You should be able to sit on the beach and then walk down to the water without having to feel like you are crossing a crazy Shanghai street. There are people trying to sell you things every where you go. Even if you are asleep on the sand you will still get people coming up and yelling at you to buy some fruit or some shells "Hey, HEY - mangoes!" was the most common. Then there was the fireworks! Obviously the women who sold fruit and shells on the beach during the day had a night job selling fireworks. From the moment the sun goes down (and sometimes they can't even wait that long) until about 1am there is the sound of fireworks every couple of minutes! It is really worse than the Shanghai horns - except its much prettier to watch! 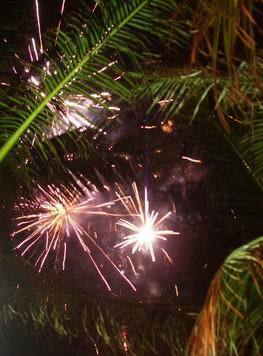 We had dinner at a beach front restaurant, literally hanging out over the sand on Christmas eve, and the fireworks were going off none stop almost next to us - it was that loud and that frequent that we could barely have a conversation. The poor lady at the table next to us had her hands over her young daughters ears almost constantly. The other big issues were littering and spitting. Just like every other part of China, no feels that its bad to litter or spit. Spitting on the beach where people are walking barefoot or laying in the sand is just repugnant - that really needs to stop. And then as a coastal area, people thought nothing of just tossing their bags and papers on the ground or into the wind - where of course they would blow straight into the water. The town around Dadonghai was filthy and constantly covered in rubbish, fruit and anything else you can think of. I think that if tourism is going to continue to grow as much as it appears to (huge developments everywhere) then the people and the government of Sanya really need to do something about the problems that will potentially destroy it. The littering has to stop because it has the potential to have a big impact on the environment. The spitting and the cars on the beach are very annoying and will have a detrimental impact on repeat tourism - Sabrina and I won't go back to Dadonghai because of those exact reasons (Yalong bay however is another story). I agree that dadonghai has drawbacks, i spent 4 days at yalong bay and it was like heaven on earth. I only saw the odd cigarette every once in a while and one noodle cup the whole time, very clean. Water is also very calm and wonderful. Thanks for the info on the beach vehicles, firework noise, fish dining, beach hawkers, and spitting. Yuck -- your review changed my mind about visiting Hainan as a beach resort! Sorry, China, it costs a lot to fly there and stay in decent lodging. I'm not going to spend my tourist budget on dirty, noisy locations. I can fly to Hawaii for less, spend about the same on lodging, count on a wide variety of inexpensively fresh food and beverages, relax on quiet clean beaches,, and enjoy a fantastic vacation with warm hospitality. Chinese tourism officials just don't get it.